The majority of the reviewers find the fit of the Adidas Predator 18+ Firm Ground to be surprisingly snug, even for those with wide feet. Several players lauded the level of comfort provided by the Stretchy Sockfit Collar and the Primeknit upper. The overall design of the football boot was appreciated by many users, including its color combination options. Some players considered Predator 18+ Firm Ground to be a powerful boot due to the enhanced ball touch reinforced by the ControlSkin layer. A few players liked the extra cushioning in the heel that prevented the formation of blisters. The Primeknit of the Adidas Predator 18+ FG offers a soft and flexible sensation to the upper, according to a few users. A few players found the general feel of the boot to be light. A couple of users felt that the firm ground boot was worth the money for its comfort and fit value. 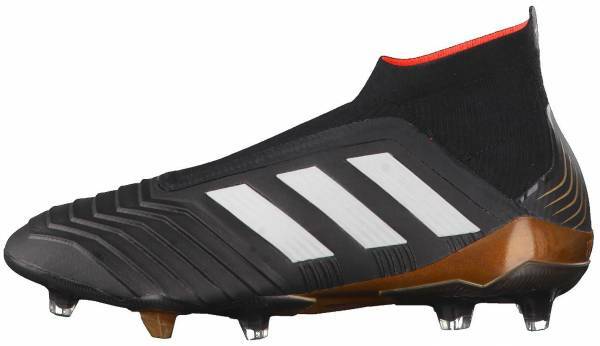 A considerable number of reviewers were disappointed that the Adidas Predator 18+ Firm Ground had an unexpected little resemblance to the original Predator. Some users find the football boot to be too narrow for their feet. A few of those who purchased the football boot have observed the poor quality of the construction which includes chipped paint and glue residue on some parts of the cleats. For a few players, the Predator 18+ firm ground boot looked “plasticky”. One reviewer noted that the Boost insole did not give enough cushioning because the layer was too thin. The Adidas Predator 18+ FG is expensive. While the upper of the Adidas Predator 18+ FG is described as comfortable and stylish, there are still reports that it did not resemble close to the original Predator. The modern overhaul was not gladly welcomed by many. On a positive note, it delivered outstanding fit and clean strikes, pretty much like its predecessor and probably also its successor the Predator 19+ FG still by Adidas. Possessing minor setbacks with its form, the laceless firm ground boot is still deemed to be worth the money through its noteworthy tech specs. It looks mean and feels awesome but it's probably not what a lot of people would expect. Despite so many skepticism over the shape, the collar, I quite like it because it doesn't interfere with my movements. But the best showstopper is the Controlskin which basically consist of a base layer of knit, with the PrimeKnit and we have Adidas' Forged Knit Technology. When it comes down to it, the choice is a pretty straightforward one. I kinda like the Ace 17+. I think it is a decent boot. For me the Predator is just much much better as football boot as a whole. The Adidas Predator 18+ Firm Ground (FG) is a football boot packed with flexible and responsive technologies that prove it worthy as a successor boot. It is a new take-on the all-time favorite, the Adidas Predator that was first released in 1994. As for Adidas, it is also considered as a replacement for the Ace series. The original Predator was a leather composition engineered to be a power boot with its Power-spine technology that improves ball control. Now, its modern version takes on power on a unique level with a totally different construction. Adidas Predator 18+ FG features three collaborative technologies in the upper that enhances ball friction in an Ace-looking laceless silo setup. The first and most dominant upper element is the Primeknit material. It is a soft synthetic material that wraps the foot for support. From the toe to the heel area, the Adidas-exclusive technology is formed with a one of a kind texture to target responsive shots. Its composition is a contemporary counterpart of the previous silo rubberized strike zones. A brand new Adidas technology is introduced as midfoot support for the Predator 18+ FG. It is called the Forged knit, which is a more structured version of the Primeknit. As what the name suggests, the material is shaped to provide lateral and medial stability. Unlike the typical midfoot innovations, it does not contain any internal cage nor tongue. It is designed that way to allow a less restrictive sensation for the foot. Lockdown is secure with the Stretchy Sockfit collar. It serves as the elastic support for the Purecut laceless boot. It is innovated to produce strikes that are free from distracting overlays and laces. The protective element of the entire upper is the Control Skin. It is a layer of thin film built to reinforce ball friction. Its function is similar to Nike’s ACC technology. Innovated for quick turns and motions, the Control Frame is the stable outsole of the Predator 18+ FG. The soleplate is constructed to work best in natural grass through its hybrid studs. The stud pattern is similar to the boots of the Ace series, but the stud shapes are unique to the silo. The Boost technology is integrated into the removable insole cushioning. It is known for its energy-returning responsiveness. Available in men’s version only, the Predator 18+ FG can be purchased in standard sizes. The boot provides true-to-size measurements. It is perceived to be adaptable for the wide footed through its Stretchy Sockfit and flexible Primeknit upper. Labeled as the Controlframe, the soleplate technology displays a standard Adidas configuration with uniquely shaped studs considered to be hybrid. The plate offers flexibility in the forefoot area while a more stable structure is observed in the midfoot and heel area. The distinct studs are shaped like irregular diamonds to strike a balance between rotation and traction. The corners of each stud contribute aggressive ground grip while its flat surface aids in making quick turns and change of directions. A mixture of Adidas standard and new technologies form the entire upper of the Predator 18+ FG. The main material which covers the toe through the heel area, except for the midfoot, is Primeknit. The synthetic holds the upper together as a one-piece construction, giving the boot a more adaptive sensation. The toe area is textured with layers of geometrical figures. The rich, textured lines continue through the midfoot that is supported by a structured material called Forgeknit. The new Adidas feature found in both lateral and medial sides, keeps the foot locked in to prevent unwanted rollovers. The trademark ControlSkin label is pasted in the midfoot to signal the innovations’ film of protection. The technology is a layering system covering the entire upper, proven to improve ball grip in wet and dry conditions. The Stretchy Sockfit collar is an added lockdown element. Its elastic characteristic allows the cleats to be comfortably slipped on. It extends as a Purecut Laceless sock, similar to the boots in the Ace PureControl series that offers a snug fit. The laceless system allows a large surface area for ball control. The external heel area is supported by a more flexible yet lower counter while internally, it is padded with a suede cushioned material that acts as an anti-slip coverage. The fully removable internal cushioning is engineered with Boost technology. The styrofoam-looking liner is scientifically tested to rebound the same energy that the foot exerts to lessen foot strains. The Predator 18+ FG is available in the Skystalker and Lone Hunter Pack colorways. The firm ground boot was headlined by some of the famous professional players including Paul Pogba, Mesut Ozil, and Dele Alli. This football boot has a laced counterpart in the form of the Adidas Predator 18.1 Firm Ground and Adidas Predator 19.1 Firm Ground.